Six people are dead and dozens more are injured after being trampled by a panicked crowd running out of an Italian disco. The stampede occurred at the Lanterna Azzurra in Madonna del Piano di Corinaldo, near Ancona -- a city on the Adriatic coast, east of Florence -- during a concert for Italian rapper Sfera Ebbasta. Witnesses said that panic ensued when an acrid smell started permeating the disco between midnight and 1 a.m. local time, according to Italian news agencies. Some compared it to mace or pepper spray, though police officials said they were not ready to confirm those details. By Saturday evening, there were conflicting reports about the number of injured. The Associated Press reported that more than 50 people were injured, while Italian media outlets were reporting that more than 100 were injured in the stampede. The six people who died included five minors and an adult. The adult, identified only as Eleonora, had gone to the concert with her daughter, who survived, according to Italian news agency Agenzia Nazionale Stampa Associata (ANSA), the nation's largest wire service. 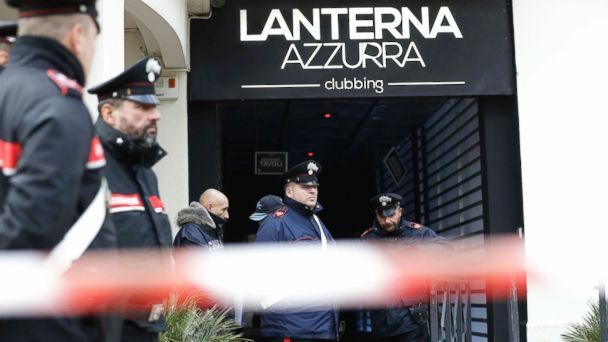 All six who died were crushed by others who had fallen five feet off a walkway outside of one of the disco's emergency exits, Ancona Police Chief Oreste Capocasa told ABC News. Capocasa said that the railings on the walkway collapsed, causing concertgoers to fall. Capocasa said that firefighters and magistrates were investigating whether there was overcrowding. The disco could only fit 870 people but 1,400 tickets to the concert were sold, he said. He said that authorities are still trying to piece together the sequence of events, and whether the spraying of some sort of substance sparked the panic. "We could not because after such a tragic event, witnesses weren't in a fit state to remember well what happened," he said. "They have not confirmed that this happened but many have confirmed that something like that happened." Those who were injured were taken to one of three hospitals in the area. Of the 120 injured, 12 remain in serious condition and seven are fighting for their lives, ANSA reported. Italian Minister of the Interior Matteo Salvini called the incident a "mix of irresponsibility and avidity." Two investigations have now been opened: one to determine who sprayed the pepper-like substance and another for overcapacity at the disco.